Have you ever wondered what a Diablo game would look like if it was placed into a Japanese setting instead? 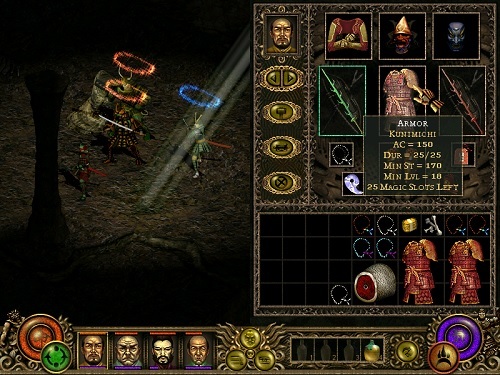 Meet Throne of Darkness, a role playing game released by Sierra Entertainment in 2001 which combines Diablo gameplay with samurai. Throne of Darkness is set in Yamato during medieval Japan, a setting that is rarely touched by the gaming industry. The game world is controlled by shogun Tsunayoshi who shares power with the leaders of the four clans. In order to seize complete control of Yamato and live forever Tsunayoshi turns himself into the Dark Warlord demon. He then proceeds to destroy all the clan leaders and their armies but one survives along with seven of his most powerful samurai. This is where the player comes in, being able to control up to four of the seven samurai in order to rid the world of Tsunayoshi. Players can also choose which clan survived the attack although this simply changes character names and their appearances. These seven samurai act as the games classes and have plenty of variety in them and when you consider the you can combine four of them into your team the options are endless. Samurai include the leader (average at everything), the archer (specialised at ranged weapons), the brick (an extremely strong polearm expert), the ninja (a rogue like character), the wizard (a spell user), the swordsman (master of the sword) and finally the berserker (capable of dealing with large groups). Each of these samurai will grow separately and require their own equipment to succeed in battle. With four different weapon types, five armour slots and four additional stat boosting slots there are plenty of items to collect from fallen foes and the various game vendors. It’s nice to see a game capture a Japanese setting so well and with the Diablo style gameplay Throne of Darkness is definitely a winner. Dark storyline that slowly opens up to players. Choose 4 samurai from 7 survivors. Huge variety of items and item slots.